A chessboard is square and flat, consisting of 64 squares, 32 black squares and 32 white squares. 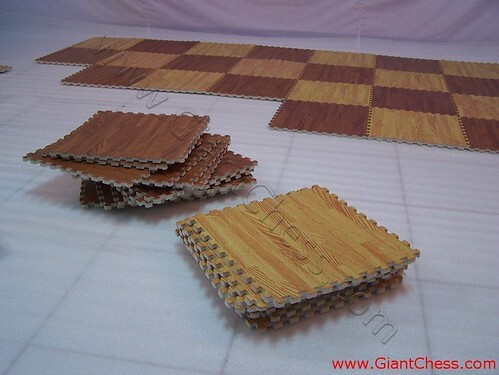 Like our wooden chessboards, our foam chessboard can also be attached to floor or ground. Because it is made from a kind of foam material, it is, like our fabric boards, very light and easy to carry, greatly appreciated by children. Though this board is regularly used for indoor play, it does not preclude the possibility of its being used for outdoor play. You can bring it when you having recreation with your family. You can take it in your car by stack it in the trunk. The chess pieces are made of Teak wood, so it will heavy to move. Because of that reason, we try to reduce your load by introduce this kind of mats chess. By using this mats chess, the giant lawn chess pieces are light enough to move easily. The chess mats will complete the chess set in your yard or recreation area.